Ok People, Let's Press the Pause Button on College Admissions Outrage. You are here: Home / Money / Business / Ok People, Let’s Press the Pause Button on College Admissions Outrage. Ok People, Let’s Press the Pause Button on College Admissions Outrage. (ThyBlackMan.com) The media is baring its rancid teeth again. We have more people whose lives we can now rip apart. In the latest frenzy of outrage and recrimination, the collective disdain and finger-pointing and “how could they-ism” of the media establishment has new, fresh meat: the wealthy and sometimes famous and sometimes powerful parents who were involved in a scheme to bribe and cheat to get their children into college. Let me be clear: what these parents did is wrong. What the coaches did is wrong. What the test-proctor cheaters did is wrong. But let’s also consider this: the whole college admissions system is rigged, and wrong, and instead of simply tsk-tsking these people who allegedly illegally paid to help their kids, maybe we should also consider why what seem to be otherwise good and upstanding people would be driven to engage in this kind of behavior. The fact is, the whole college admissions system is rigged in one way or another to give unfair advantages. It is rigged to give preferences to black students, even if their parents are wealthy, their schools comfortable, and their lives privileged. It is rigged to give preferences to athletes. It is rigged to give preferences to Hispanic students who write admissions essays (read by liberal college admissions officers) arguing that their family has been oppressed. It is rigged to give preferences to people who can donate $20 million to a school, have a building named after their family and have “helpful” calls made on behalf of their children when they apply. Is any of that fair? Parents love their children. The want to do right by them. Most parents would gladly give their lives for their children. Believing that admission to a particular college is crucial for their child’s success or imagining that it is the fulfillment of a dream—these parents looked at a system that is, by any fair account, rigged to favor a few, and they tried to make their children one of those few. Now here’s where this gets hard: my bet is that 98% of the people involved in this scheme are upper middle-class white people. Their children, I bet, are mostly good people: involved in the community, good students. And the fact is, college admissions is rigged against white and Asian students, who often have to have better test scores and better qualifications, simply to gain admittance to a college. 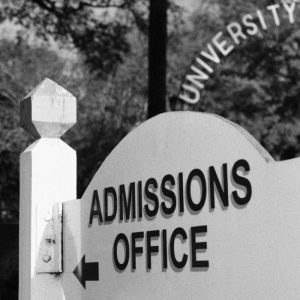 The reality in many of these universities is that by the time you subtract preferences for minorities, the spots reserved for athletes, the preferences given to the children of donors, the places taken by children of the well-connected, college admissions is a process where the only people seemingly ‘guaranteed’ a spot, are people who have the system rigged in their favor. It’s clear, from reading some of the emails, that many of these parents were trying to ‘rig’ a guaranteed spot for their kid. Think about this. Being on the Board of Trustees of a college and giving $20 million and talking to the college admissions officer about your kid or a friend’s kid, is legal. Being a black student with lower test scores than other applicants, but getting a special preference, is legal. Being Hispanic and having lower test scores than the average applicant but writing an essay about the prejudice your family faced and playing to the sympathies of the admissions committee, is legal. All of it plays to getting a special advantage in admissions. And all of it is legal. What these parents did was clearly illegal. It is not justifiable. It is wrong. But for anyone who has ever loved their child—it is understandable. I’m not justifying their behavior, but I understand it. If you love your kid, wouldn’t you do anything for them? And when you look at a system that is so clearly rigged, why wouldn’t you try to rig it in your kid’s favor? It’s easy to blame the parents. And, they should be blamed. But let’s also not let the colleges off the hook completely. Everyone knows that the system they’ve set up is rigged. So, let’s unrig it. Make all admissions blind. Instead of names on applications, substitute an anonymous number. No information should be included about race or gender. No contact should be allowed between rich, well-connected donors and college admissions officers. Applications should be graded in the way that some law school classes are graded—blindly—based on the quality of the application. Let’s have blind admissions. Let’s unrig the way that America admits young people to colleges. What these parents did is wrong. But the system itself is wrong. Let’s see if the liberal media, the celebrities, and the college admissions officers are willing to ask hard questions about the very system they all support.